The Suns' P.J. 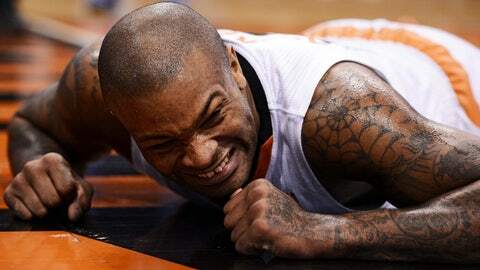 Tucker reacts after falling to the floor during in the first half Saturday night against the Mavericks at US Airways Center. Tucker had 16 points and two of Phoenix's 15 3-pointers in a 123-108 victory. PHOENIX — First-year Suns coach Jeff Hornacek was one of the NBA’s best shooters in his playing days. His team did him proud Saturday night. "Offensively, it was probably our best game," Hornacek said. "If you share the ball, then everybody gets a feeling of confidence that is way up," the Suns’ Goran Dragic said. "We are shooting the ball well. This is so much fun, playing like that. Everybody is on the same page and when we play like that I think it’s hard to stop us." "Every time we got close they knocked in a 3," Wright said. "They shot the lights out." "It opens up everything," Bledsoe said. "They came out firing on fire," Ellis said. "I think our biggest challenge right now is to stay disciplined in some defensive situations," Dallas coach Rick Carlisle said. "We’ve had too many gambles, too many bad fouls in late shot clock and too many things that lead to chain reactions that we’ve got to eliminate."